Signal turns your iPhone, iPod touch, or Pocket PC into an advanced wireless remote control for iTunes on your Mac or iTunes, Winamp, or Windows Media Player on your PC. Control playback, browse or search your media library, and edit playlists from anywhere in the house - all from the palm of your hand. Stop going back to your computer every time you want to pause the music or change the song. Signal gives you the ability to control your music from wherever you can hear your music, so you can change songs from the comfort of your favorite chair or rock your next party from the deck, patio, or any room in the house. Signal offers an interface specifically designed for the iPhone and iPod touch, and takes full advantage of the device’s capabilities to provide a two-way, live updating view of your media player. All from a fun and easy-to-use handheld interface. Signal really shines when you connect your computer to your stereo. Streaming solutions like the Airport Express allow you to wirelessly send music to your stereo, and Signal gives you the freedom of wireless control to go with it. Put them together and you get a simple solution to play and control your music through the whole house. Signal supports iTunes on your Mac or iTunes, Winamp, or Windows Media Player on your PC. 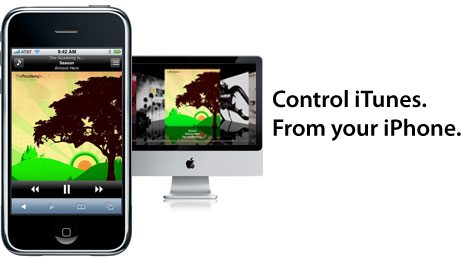 You can use an iPhone, iPod touch, or a Windows Mobile Pocket PC as your remote. Setup is simple, just install and go. Copyright © 2007–2016 Alloysoft, LLC. Apple, iPhone, iPod, and iTunes are trademarks of Apple Computer, Inc. Winamp is a trademark of Nullsoft, Inc.